First we need to discuss the beautiful stone called "Larsonite." You will find rants on the web about this and similar names. The "-ite" extension should be reserved for different types of stones, those considered different mineral species. 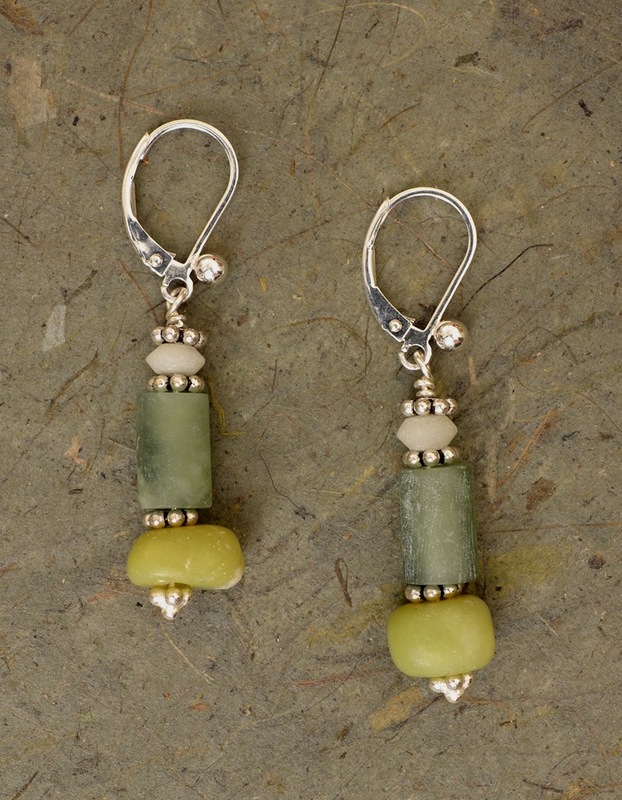 It should not used to distinguish different varieties of jasper. 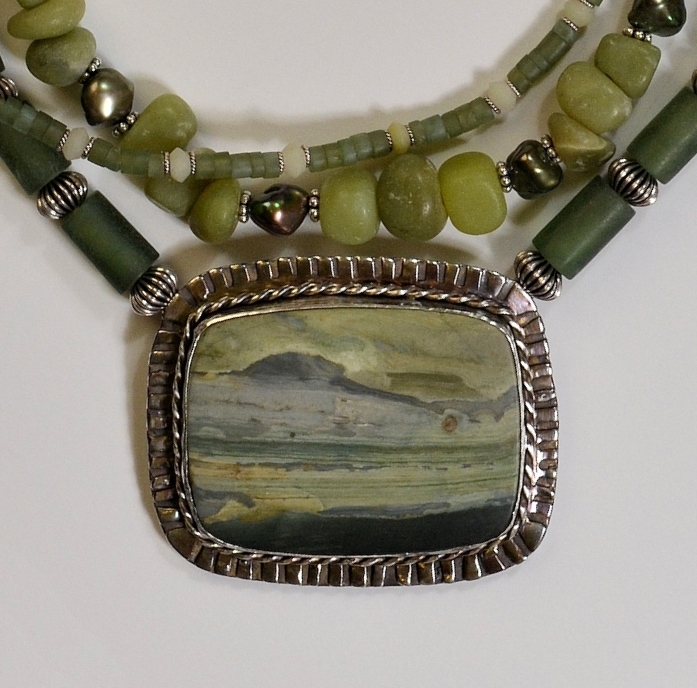 This material was originally named "Gary Green Jasper" by Gary Macintosh, the founder of the McDermitt Rock Shop in McDermitt, Nevada. McDermitt straddles the Nevada Oregon border, so sometimes Gary Green is said to come from Oregon, sometimes from Nevada. 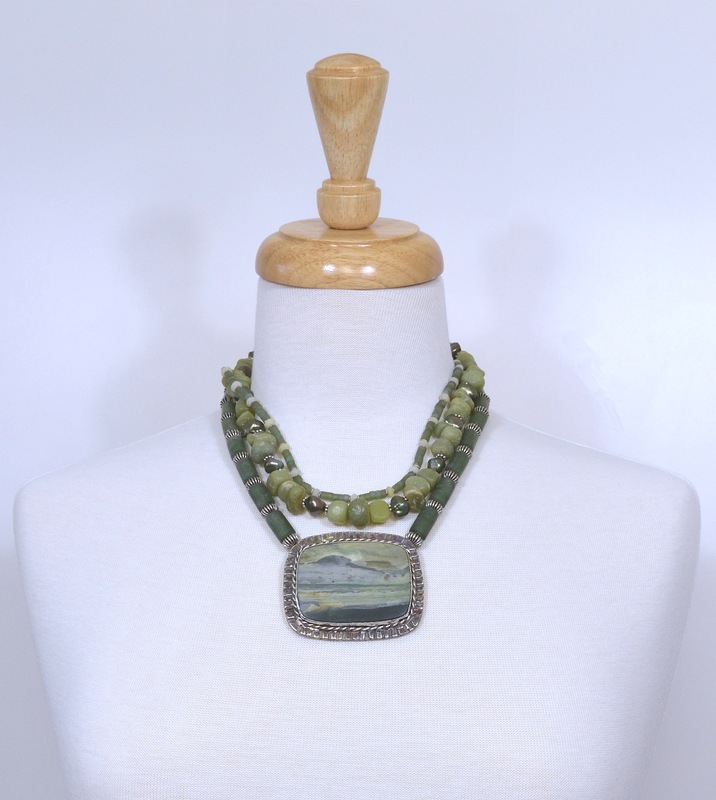 Other names include McDermitt Green Jasper, Harlequin Ribbon, Orbicular Larsonite and Bog Wood. Technically, Gary Green Jasper is a "bog wood" from the McDermitt, Nevada/Oregon area so that explains about half its names. At any rate, Hettie's Rock Shop gives us the following helpful information about it: "Wood, algae, other swamp vegetation and mud were covered by volcanic ash between and 11 and 14 million years ago. Water carrying minerals seeped in creating the green colour while it petrified. The colours are from a combination of iron, alluminum, potassium, sodium, and calcium." The scene looked chilly and watery to me, so naturally the voyage of St. Brendan came to mind. I love Caitlín Matthews work, especially The Celtic Book of the Dead (below) with its mysterious images and rich layers of meaning. At the exoteric level, some propose that the voyage was not only a mystical one but an actual one, and Tim Severin literally staked his life on finding out if it were possible that an Irish monk could have crossed the Atlantic and reached the new world 1,000 years before Columbus. Gary Wilson cut this lovely stone and left it with a lustrous matte finish. 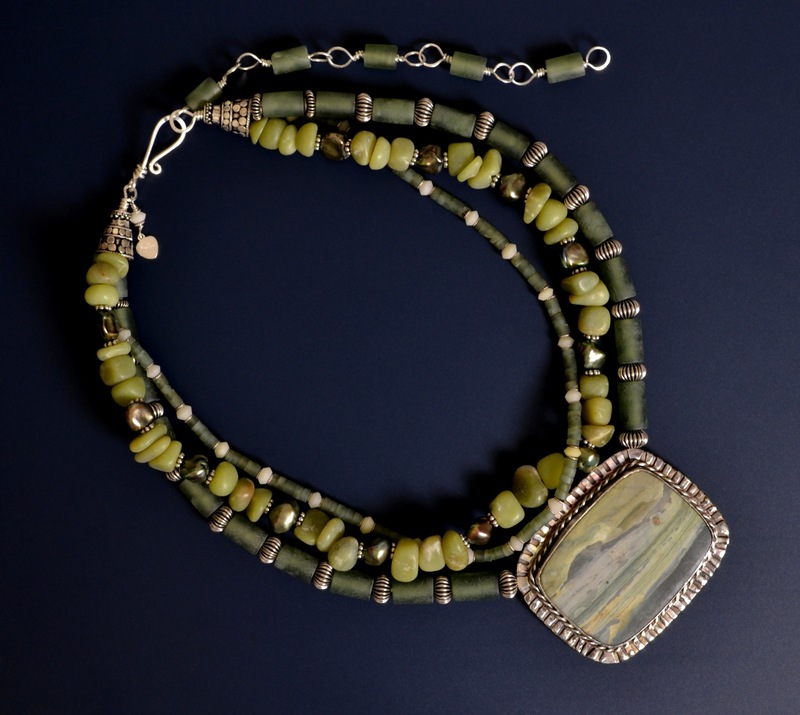 The soft colors of the Serpentine beads blend perfectly. Please order it today and embark upon your own magical voyage!